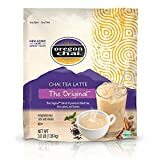 Oregon Chai Tea Latte is a brand of chai tea concentrate. The caffeine amount above is for 1 serving of the concentrate, which then should be mixed with milk to desired taste. 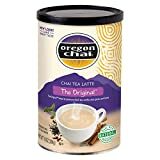 Oregon Chai comes in a number of flavors and formulations (including both caffeine-free and sugar free varieties). (Original) Water, organic* evaporated cane juice, honey, organic* spices, organic* black tea, ginger, organic* vanilla, organic* natural flavors and citric acid. (*Organically grown and processed in accordance with the California Organic Food Act of 1990). Sugar content: 18 grams (per 4 ounces). 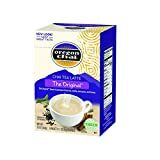 How Does Oregon Chai Tea Compare? Oregon Chai Tea contains 8.12 mgs of caffeine per fluid ounce (27.47mg/100 ml).